We make this dish A LOT... once a week maybe. Different variations of it, with noodles, without noodles, with rice, with lettuce, with cucumbers... But it definitely is one of my favourite dinners. It's light, healthy and bursting with flavours. This time I tested out Thai basil as a new addition and boy was it worth it. Too good! I have no clue why I haven't posted this before and have about three drafts of a variation of this salad sitting in my posts folder. But hey-ho, here we are two years and about 50 thai turkey salads later and you finally get to try it. Heat approximately one tablespoon of rapeseed oil in a wok. Once hot add the onion and chilli and sautée until they start to soften. Remove from the wok, add a little more oil then add the turkey mince bit by bit and fry until starting to brown. Mix in the onions, chilli, basil, fish sauce, palm sugar, lime juice, soy sauce and green beans. Stir until all is well incorporated and cook for a few more minutes until the meat is cooked through. Taste and season a bit more if necessary. 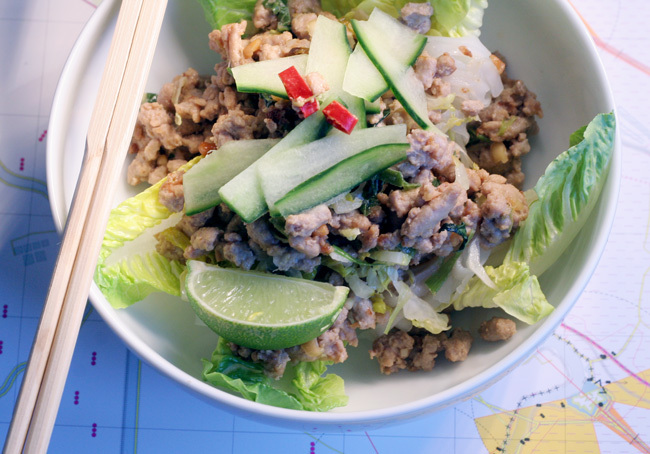 Place the lettuce leaves into bowls, top with the noodles and drizzle with a little soy sauce. Top with the mince and cucumbers. 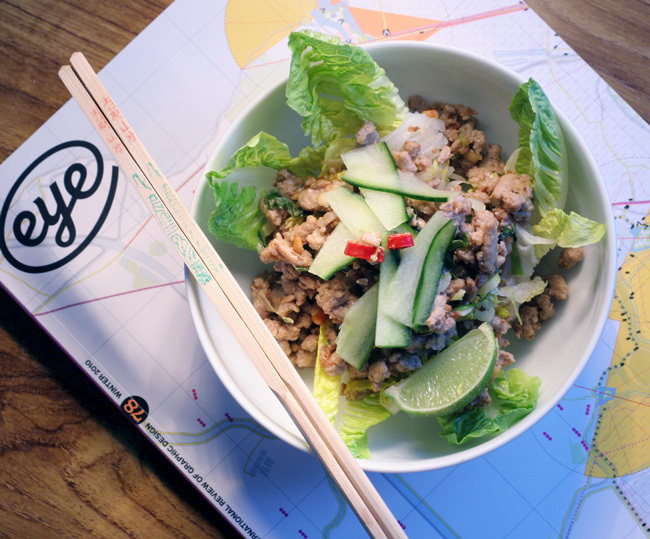 Drizzle with a little sreracha crushed peanuts and spring onions.